Posted on September 26, 2016 at 12:35 pm. 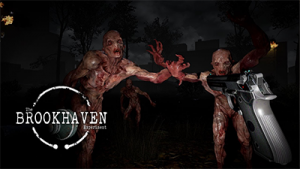 Gamblit Gaming are proving to be quite the opportunists this week as they unveil their real money gambling experience via the popular virtual reality shooter game, The Brookhaven Experiment. Created due to a partnership struck up with the developer behind the VR title, Phosphor Games, this innovation will allow Gamblit Gaming to fulfil their vision of closing the generation gap at land-based casinos. The Brookhaven Experiment sees players trying to survive in an apocalyptic world overloaded with monsters, and players will now be able to bet on whether they will survive each wave of attacks – wagers are set at a minimum of $15 and a maximum of $50. This will be rolled out via a Virtual Reality Cube (VRC) and will make its debut this week at the Global Gaming Expo (G2E) in Las Vegas. The VCR will also allow fellow players to watch on external monitors, and they can place their own bets on how the player will do via the tablets provided. Chief Marketing Officer of Gamblit Gaming, Darion Lowenstein, praises the partnership, recognising the impact the game has already had on the public. “The Brookhaven Experiment is not only the most petrifying, heart stopping and realistic experience I’ve had in VR, but it truly embodies the concept of virtual reality,” he said. The CEO of Phosphor Games, Justin Corcoran, also acknowledged the iGaming and video gaming industries in a recent statement, noting the huge potential virtual reality has for both. “With The Brookhaven Experiment, we wanted to be on the forefront of the video game industry as it stepped into the new world of virtual reality, and now with this fantastic partnership with Gamblit Gaming, we have the opportunity to be on the forefront of the transformation of the real-money gaming industry as well,” he said. The launch goes hand in hand with Gamblit’s mission, with their primary focus of attracting the younger generation to the casino floor – it is thought millennials tend to steer clear of the older pokies which lace land-based casino floors. The company has been proactive with its mission, also recently announcing a deal with Caesars Entertainment to roll out the Gamblit’s Model G and Tristation positions – real money skill-based games – across casinos in Vegas, California and other regions.